Whenever Network firewalls is implemented in a network, you rest assured that outside threats have being kept away from accessing sensitive data which is available inside the network. It is a wide thing on every network that whenever different networks are joined together, there is always this threat and lack of trust to an extent that someone from outside of your network will tends to break into your LAN. And as such in the case that these threat excalate break-ins may result in private data being tampered with, assessed and even go as far as being stolen and distributed, valuable data being altered or destroyed, or entire hard drives being erased. To prevent and avoid all these mischievous and un for told stories, firewalls are implemented and serves as a means of preventing or minimizing the security risks inherent in connecting to other networks. 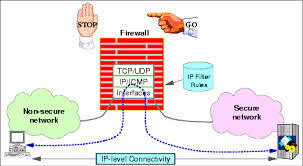 It is important to note that a properly configured firewall plays a key role in efficient and secure network infrastructure deployment. If you’re having trouble securing your network here I have made a script for the essential Firewall rules that will help to protect your router. All you need to do is to go your router menu, click new terminal and paste the script below, after that you press enter. you are getting an error when loading the script change the interface name in the script to the name that is assign to your router’s WAN interface.